Lunch and Rides at Scenic World are not included on this tour. Please note that the road to Jenolan Caves is windy, it is the responsibility of the passengers to decide if this tour is best for them. PLEASE NOTE: Prams and Strollers are not permitted on the Scenic Railway, Jenolan Caves and sections of the scenic walkway are not wheelchair accessible. 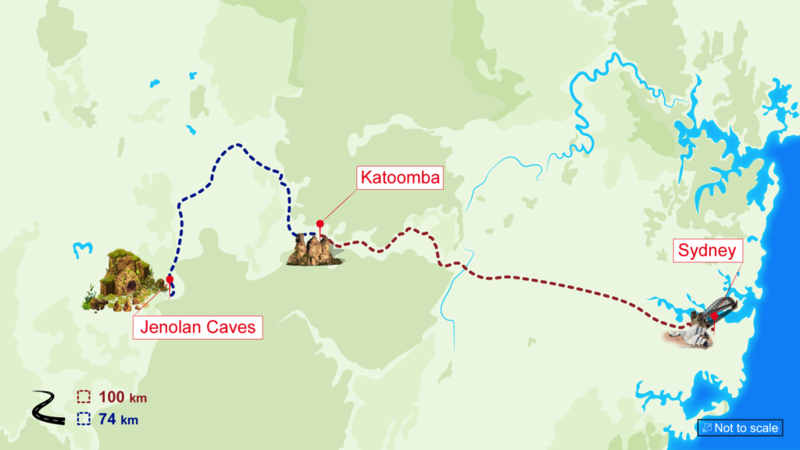 Warm Clothing, the Blue Mountains and Jenolan Caves are sometimes cooler, it maybe an idea to check the Katoomba weather forecast for the day that you are looking to book. Extra Money for food, drinks. Children's rates apply from 3 - 12 year old Under 3 years old not taking a seat travel Free Please note prams and strollers not permitted on some Scenic World rides and Jenolan Caves. Pickup is available from either the Sydney YHA Central, 11 Rawson Place (at 07:10 am) or from your Sydney accommodation. Please click here for a list of pick up locations and times. Set off towards the beautiful Blue Mountains in a comfortable, air conditioned coach. Along the way, you'll be enthralled by the stunning scenery as the landscape changes from city to suburbia to lush bushland. Upon arrival to the Blue Mountains, you'll visit Scenic World, one of the Blue Mountains' prime attractions - encompassing the Three Sisters, the Scenic Railway, the Skyway, the Cableway and awe-inspiring views over the Jamison Valley. Here, you can opt to ride the Scenic Railway, Skyway or Cableway (all rides at own expense), enjoy a mug of hot chocolate at the cafe or take pictures of the iconic landmarks. Next, you'll visit the amazing Jenolan Caves - the most popular and largest subterranean limestone cave system in Australia. At the Caves, you'll embark on a guided tour of one of the caves,normally the Lucas cave, seeing impressively lit stalagmites, stalactites and other fascinating limestone formations. The cave systems at Jenolan Caves are truly beautiful and well worth the visit. While here, you'll also have the chance to see the mysterious and alluring Blue Lake, as well as the majestic Grand Arch. For lunch (own expenses), you'll stop at a licenced bistro near the Caves for a choice of mouth-watering meals, as well as snacks and beverages, before heading back towards Sydney. As you near the city, we stop at Homebush Bay Wharf, where you'll board a river cruise for a peaceful tour of the attractive Parramatta River. Enjoying some delicious afternoon tea and drinks, you'll be able to sit back and take in the scenery, as well as have some of the primary sights along the shoreline pointed out to you by the skipper. Arriving later at Circular Quay, you'll disembark and make your own way back to your accommodation.